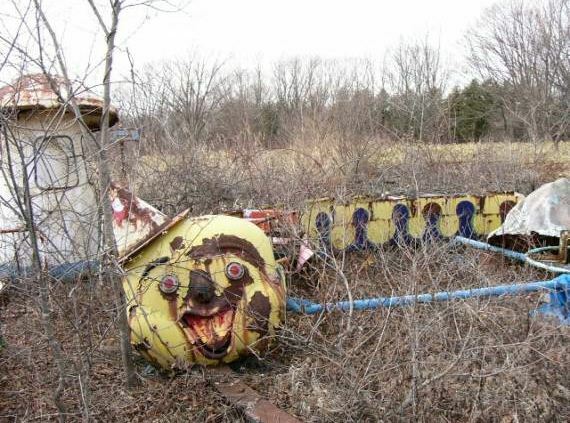 Abandoned clown train remembers you. There's just something about the image of a playground that's been abandoned and neglected: chipped paint, rusted or partially decayed metal frames, overgrown sandbox, empty swings swaying ominously in the breeze, the conspicuous absence of the normal sounds of children playing and laughing. Everything seems empty and broken, in contrast to the usual cheerful feeling that a place where children gather is supposed to invoke. The scene may be creepy, or just forlorn. Sometimes this is used to illustrate the nostalgic longing for a disappeared childhood and the pain of growing up, or the loss of innocence. Other times the Abandoned Playground is home to a Creepy Child humming an Ironic Nursery Tune, or haunted by ghost children, either stringy-haired or cute. If the playground shows up in an After the End setting, or in an area that has faced great destruction, an abandoned playground is shorthand to show that adults weren't the only victims of the terrible tragedy that has befallen the place. This could also include playgrounds that aren't actually abandoned, just empty. Visiting a place like this after hours when all the children have gone home can be equally strange and unsettling. Or it may be a good place for our protagonists to sit and contemplate their problems. The image provides a well of symbolism for writers to dip into, which is probably why these places appear so much in fiction. An empty playground shows up in The End of Evangelion as a metaphor for... something, probably. One rather creepy scene in Paprika is set in one of these. This featured in Garth Ennis' Crossed, particularly the early ads for the series. A significant part of The Killing Joke takes place in a most derelict amusement park that The Joker 'bought' for his own purposes. In Aeon Entelechy Evangelion in the dome where Rei lives (and the Dome itself is a Ghost Town) there is a "recreational area", a small patch of grass with the tree (probably transplanted) on it, which has a swing. Subverted in All in the Family. The Warden and the Mistress head out for this in Chapter 3. It then turns out not to be abandoned after all, as a mom with a young daughter comes along and kicks them off a swing. Jason Goes to Hell: The Final Friday. Outside of Jason's old, abandoned home is a small playground where the protagonists battle Jason at night. Used in Terminator 2: Judgment Day in a brief piece recapping how the future's going to turn out. Optional skulls added. The opening credits are of the same playground, as the whole thing burns in nuclear fire. Coupled with the music, the effect is powerful. Flatliners. While David Labraccio is trying to track down Winnie Hicks so he can apologize to her, he goes to the school playground where he tormented her as a child. We see it as it was (with all of the children), then the children fade away leaving just the Abandoned Playground, revealing that the scene we just saw was Labraccio's memory. The French short Replay explores the emotions of a boy in a Fallout-style dead and deadly world, and he finds his way to a park like this in a nearby ruined city. Watchable here. Look carefully in that scene. Robert Duvall, in a priest costume, is on one of the swings. There's one in The Exorcist, too. Featured in a deleted scene of the Dawn of the Dead (2004) remake, set right after Kenneth finds Anna. There are lots of toys lying around and a baby carriage too. The Firefly movie Serenity has one of these in the newly destroyed by Alliance forces colony on Haven. River wanders through one and get a nice framed shot between a swing set that is on fire. Koyaanisqatsi includes some shots of an abandoned playground in the abandoned Pruitt-Igoe housing project, just before its demolition. Red Dawn (1984): Matt and Jed are sitting in one of these as they die. The film of Harry Potter and the Prisoner of Azkaban features one of these as Harry runs away from the Dursleys' place at night. For some reason that is never explained, the swingset and merry-go-round start to move on their own. Several of the later scenes including the climax of the "Hanna" take place in the decrepit remains of a Brothers Grimm theme park near Berlin. It is creepy as outlined in the trope description, but symbolically appropriate to the passing of Hanna's unconventional childhood. In Edge of Tomorrow, there is deserted trailer park including an Abandoned Playground behind the enemy lines. In Pinocchio, this is what Pleasure Island ends up looking like after the boys are turned into donkeys and rounded up by the Coachman. Jiminy: Where is everybody? This place looks like a graveyard. The Dark Tower (2017). Roland and Jake find a derelict theme park entangled in a forest that has grown up around it. Jake has to tell Roland what it is, as to the latter it's just another strange construction from before the world moved on. Anna and the Apocalypse: This is where Anna gets her first kill in the movie. She stays there with John for a little while afterwords in order to figure just what the heck they're going to do. In Harry Potter and the Prisoner of Azkaban, he sits in an abandoned playground after a fight with the Dursleys when the Grim appears. The playground is only empty because it's the middle of the night, but in the movie version, art director Dave McKean makes the scene surprisingly creepy, even though it's daylight. In Order of the Phoenix, Harry has a Trauma Swing moment in a locked, vandalised park before Dudley and his friends show up...followed closely by Dementors. The Fictional Video Game in Ender's Game has a creepy playground level, inhabited by children who turn out to be wolves. Ender has to kill them to proceed. "A bird flew over it in silence. And I felt that no man would ever be happy there again." Dexter is Delicious features Buccaneer Land, an abandoned amusement park Dexter and Deborah used to love when they were children. It has fallen into disrepair and is now home to a bunch of fake vampires and real cannibals. Are You Afraid of the Dark? has this in the theme song. In Season 2 of The Wire, after Ziggy confesses to murder, his cousin Nick gets drunk in the old playground where they used to play and reminisces about it. In Season 3, drug kingpin Marlo holds court in an abandoned park/playground because it's difficult to bug. In one of the early seasons of Charmed, Prue and Phoebe get stuck in one of these. Home of all the creepy demon kids the Ice Cream Truck Man drops there, and The Nothing will slowly pick off anything that lives there. The Barracks on Lost have a swingset, which was used happily by the Dharma kids (Ben, Charlotte) in the 70s. However, in present day it just serves as a reminder that the Others can't have children. The Cold Open of "Lie to Me", an episode with a theme of how the illusions of childhood give way to the Black and Gray Morality of the adult world. There's a boy who's been left at the playground. It's dark, and he's the last one there, and then Drusilla shows up. Fortunately for him Angel shows up and stops her. The episode where Buffy reaches her eighteenth birthday has an Action Prologue of Buffy fighting a vampire in a playground at night, with all the 'leave childhood behind' metaphors that implies. In one episode of Supernatural Sam notices that a playground is empty at four in the afternoon; it's the first sign that something is wrong with that town's children. The Fugitive had its series finale set in an abandoned amusement park. Dollhouse. Echo is programmed to believe she's a baby's mother in "Instinct". At the end of the episode when she's forced to give the child up, she sits in a playground in the park at night with her handler. Covenant mentions one of these in "The Road", based on the Cormac McCarthy novel and film. "This was a fairground not long ago, a Ferris wheel and a proper show." "Black Gold" by Soul Asylum. This spot was a playground. The Little Fears: Nightmare Edition has one of these in Closetland, made worse by being intended to kill or trap children on top of it. The PC game The Path features one of these in the woods. The site is where Ruby meets the wolf. There's one in Final Fantasy VII in the slums of Midgar. There's a few in Half-Life 2, which are both creepy to see and fun to explore - a lot of the equipment responds to the physics engine. They're abandoned since humanity's reproduction was repressed 20 years prior, so all the kids are grown up and there's no replacements being born. You can also hear the faint laughing of children in the first one you come across. Silent Hill: Homecoming has an abandoned playground. You can find a photograph by the slide! Silent Hill: Shattered Memories also has one, and in a possible callback you can find an Echo Photo and Echo Message there. Fallout 3 has several irradiated children's playgrounds. The most prominent example (because it factors into an early, and very long, quest) would be the town of Minefield. As the name implies, it's full of mines and a sniper. The quest involves making it to a certain part of the playground and (optionally) taking back a mine with you. The DLC Point Lookout has an abandoned fairground. Modern Warfare features these on at least two occasions. One is the playground where Jackson dies soon after the nuclear blast. The other is in the Pripyat flashback. Both scenes are made even creeper by ghostly voices and laughter of children that are no longer there. The former is probably a Shout-Out to Terminator 2: Judgment Day above. There's also one outside the Afghani school in Modern Warfare 2. Shadow of Chernobyl and Call of Pripyat features the same playground in Pripyat that appears in Modern Warfare. This playground exists in real life. A more fictional example appears only in Clear Sky, in the Ghost City of Limansk-13. Being an inner courtayrd's playground unlike Pripyat's, it's a much smaller one. Call of Duty: Black Ops also has an empty playground. It's in the level "Rebirth", right in the middle of the area covered with Nova-6. There's some creepy old playground equipment, complete with squeaking swing, next to the restaurant at the gas station in Barrow Hill. The playground in Fate/stay night gets this treatment whenever Ilya isn't around to play with you, particularly in the Heaven's Feel Route. Said route also has Shirou sit down on a bench to contemplate whether to save the girl or save the world. In an outdoor level of Metro 2033 there is one of these, and when you enter it, you see a flashback of kids playing. When the flashback ends, some of the equipment is still moving and you see a Dark One observing you. In Left 4 Dead 2 there's an abandoned playground in the level of Hard Rain, this serves as a landmark for the player(s) when they're getting back to the boat. There is a playground right outside the house on the first part of Slender: The Arrival. In season 2 of The Walking Dead the climax of Episode 5 takes place just outside of a rest stop's abandoned playground. Pokémon X and Y has one on Route 14, although nothing weird happens there—just a friendly Pokemon battle. The Secret World has several, but notable examples include the Atlantic Island Park in the Savage Coast region. The Subspace Emissary adventure mode in Super Smash Bros. Brawl features a level called the "Ruined Zoo", that certainly gives off this vibe. Here, you play as Lucas trying to outrun a Giant Porky Statue. One entry in Marble Hornets has Alex fleeing (or seeking out) the Operator in a deserted playground. And then again in Entry #70 when he apparently returns to the same playground. Subverted in Suburban Knights, in which they battle on a playground that appears to be abandoned until a mother and daughter come to play. Angry Joe protests that the girl's too old to play there, and gets a Dope Slap from an outraged bad guy. They try to continue the battle on another one, but the TGWTG team escape before the Cloaks set up. Plus, it's not as cool as the previous one. The Simpsons — Season 7, Treehouse of Horror VI, Segment: Nightmare on Evergreen Terrace. Bart battles Willy at night in a foreboding, nightmare playground which is empty until the battle. Parodied in another episode where Bart calmly strolls through one (with an Ironic Nursery Tune playing in the background), with complete Genre Blindness. On American Dad!, there was an abandoned playground in the vasectomy clinic video showing the wonders of a childless future. In Futurama, turns out that Robot Hell is located in a abandoned amusement park. In New Jersey! In Gravity Falls, part of Stan's mind is represented by one of these. We see it again later, only now it's not abandoned, and is in fact being used by Stan and his brother as children. Six Flags New Orleans. It closed in 2005 to prepare for Hurricane Katrina and never reopened. Various proposals have been made to revive or replace the park, but the theme park remains abandoned and in extremely poor condition. River Country , the first water park at Walt Disney World Resort, was closed in 2001 and currently sits abandoned but thanks to being really close to the other Disney parks and hotels in Orlando is visible from other locations. Abandoned for various reasons that included high levels of a potentially dangerous amoeba in the lake water that was used in the park, a law that protects tourists from local unfiltered lake water, and a large drop in attendance thanks to being pitted against the larger Typhoon Lagoon and Blizzard Beach water parks. Despite being closed for several years the lights are still on and the plumbing still works, there's abandoned furniture and clothing and toys lying around, the slides and stairs are overgrown with vegetation to the point of being barely visible, and the man-made river and pools are stagnant and/or nearly evaporated. Incredibly frightening if you find pictures people have taken of inside the buildings. Disney does intend to demolish the remains and place a hotel on the land. Chippewa Lake Amusement Park was a very well known abandoned park in the American Midwest. When the park was closed in 1978 all of the still functional rides and buildings were simply left on the property untouched and unmaintained for 31 years. Time took its course and everything soon broke down and became overgrown by plants and trees. By the mid-2000's the buildings became dilapidated and most have since burned down and/or collapsed from fire damage. However, many rides and a single building (the hamburger stand) continued to stand in varying states of decay. Most famously the Ferris Wheel ◊ and Roller ◊ Coasters ◊ which had trees growing in and through them. As of 2010-2011 the park is now being torn down. The hamburger stand and coaster have been demolished and the remains of buildings and rides will be likely be removed soon. The Ferris wheel and tumble bug ride are being saved to be possibly be restored. A temporary example of an abandoned theme park was Kentucky Kingdom in Louisville, which closed in 2009 amid the bankruptcy of Six Flags (which had operated the park) and remained closed until a former operator of the park put together a deal to reopen it in 2014. Lake Shawnee Amusement Park in West Virginia, the site of a desecrated Indian Burial Ground turned into a settler farm which saw three settler children killed by Indians and several Indians killed by settlers in retaliation, turned into an amusement park in the 1920s. After two children died, the park shut down in 1966 amid rumours of the land being cursed and haunted, with the rides and structures still standing in varying states of disrepair. It was briefly reopened in the 1980s, then abandoned again. Tours are available in the days leading up to Halloween. Geauga Lake Amusement Park in Aurora, Ohio. The park closed in 2007 after over 100 years in business under various forms after its parent company was unable to restore visitor traffic lost by a few years of ownership under Six Flags. Even though every ride was very quickly torn down—with one exception. Every building in the park including the main gate was left standing as late as 2016, nearly ten years later. The many themed areas of the park are still standing with signage and paths still in place twisting past run-down buildings and concrete footings where rides used to be located. Just one ride was left standing for nearly ten years, a historic wooden coaster named the Big Dipper, and video footage showed it also taken back over by nature. For ten years the park even stood across from a very busy water park called Wildwater Kingdom. When even that closed in 2016 everything there was demolished very quickly before it could reach the same state. A lot of Geauga Lake's buildings did finally get demolished in 2016 but the empty park remains due to mismanagement by the city of Aurora and the company that owns it.